Encrypt Your PayPal Buttons In A Single Click... Eliminating Digital Theft And Protecting Your Profits! Did you know that the average cyber-thief can STEAL your digital products in LESS than 30 seconds? That means you could be LOSING money at this very moment! In case you're not already aware, there's a CRITICAL overlooked PayPal security hole which affords cyber-thieves the ability to download your digital product or access your members area. How? All someone has to do is look at your source code in order to view the redirect success URL address located in the PayPal buy button code. And once they've got that, they can simply go to that page and do whatever they want...for FREE! can steal your digital products! bypass the payment process altogether! alter or completely delete your sales code! virtually swipe your profits right out from under your nose! purchase your digital product or service for $0.01! access your membership area free of charge! resell your product and enjoy YOUR profits! How much money do you want to lose simply because you haven't encrypted your PayPal source code and secured your download pages? Believe it or not, the reality is that sooner or later, your product will be accessed illegally unless you take preventive steps now! The good news is, you're only minutes away from locking your PayPal source code and protecting your profits once and for all! "Finally! Quality Software That Provides SO Much Convenience You'll Wonder How You Ever Got By Without It. PLUS You Get Premier Encryption That Will Stop Cyber-Thieves In Their Tracks!" PayLock Generator will allow you to create encrypted PayPal buttons right from the convenience of your desktop. It is a simple software program, which literally does all the work for you. PayLock Generator is the PERFECT desktop companion. Simply complete the exact same fields that you would in your PayPal account. Save time and more importantly lock up your products and profits with a simple click of your mouse. Can you afford not to lock your PayPal source code? Get your copy of PayLock Generator before a would-be thief visits your site. That's right! Generating PayPal buy buttons is now a simple point and click of your mouse on the PayLock Generator icon that sits right on your desktop! The only reason you should want to go into your PayPal account is to access your money. I just wanted to let you know that you've got a great piece of software here. 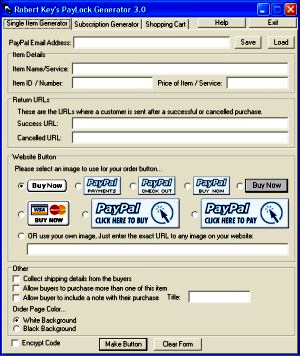 PayLock Generator is fast, easy to use, and makes creating secure PayPal buy buttons a breeze! I've used other encryption methods but they just can't compare to what PayLock Generator has. This is one method that offers top-notch security without requiring countless hours spent installing complicated scripts. For anyone using PayPal buy buttons on their websites, the PayLock Generator is definitely a must have!" This software is super! Just now when I was working on some PayPal buttons for one of my web sites, I found myself opening my browser and going to PayPal.com to generate the button. Suddenly I remembered that I had a copy of PayLock Generator on my hard drive, so I opened it up and created a button in a fraction of the time. I was really impressed with how much of a difference it made to have such power and ease of use right on my desktop. As a bonus, I had the option to encrypt my PayPal source code and protect my sales! Way to go on this one, Robert!" I just wanted to thank you for creating such a fantastic product! The PayLock Generator is a must-have tool for anyone doing business online. I feel much more confident now that I have encrypted my PayPal buttons and can rest assured that my profits are going where they should be! You can be sure that I will be recommending PayLock Generator to my friends and subscribers. All the best to you!" own sales, eliminate PayPal theft and now YOU can too! Truthfully, I can't imagine why you'd want to sacrifice the security of your sales. If you choose not to safeguard your PayPal cash with PayLock Generator, you're basically handing your money to cyber-thieves! And you have to admit, $9.95 is a small price to pay compared to the $100's or even $1,000's that could be stolen from you. If for any reason you're not 100% satisfied you may simply request and receive a 100% refund with no questions asked. Today For Only $9.95 100% Risk-Free! I'm so confident that this theft protection software will increase the returns on your products, that this incredible offer is secured by my personal 30-day unconditional 100% money-back guarantee so there's absolutely no risk whatsoever! P.S. Yes, you can create your PayPal buttons without PayLock Generator, but can you easily encrypt your money making download URL so it can't be stolen from your source code? Everyone who offers products for sale using PayPal absolutely needs this encryption feature. I use it and am guaranteeing to return your money if you are not satisfied with your purchase.